Amy is the winner of the Valentine Cupcake print giveaway. Congrats Amy! Send me your address and I'll get it in the mail right away. I started this little painting today and should have it finished in the morning. You'll see it finished in my next post. I must get back to my folk art villages next. Any ideas? I seem to have a block for some reason. 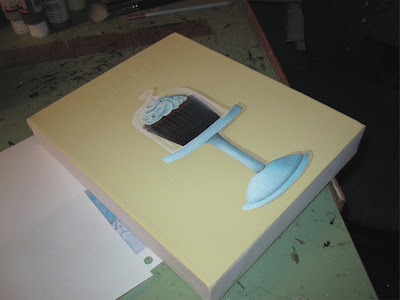 I think I've been painting too many cupcakes and can't get my mind around something more involved. I also need to decide if it will be painted on a large 24" x 30" canvas or a small one. I would like to get rid of this last large canvas that's taking up space in my studio. Also, I know that most of you thought I should keep the "Sweet and Irresistible" painting, but I've listed it on eBay. I'm having a hard time deciding what I want on that wall above the shelf, but I'll know it when I see it. Above the stove is really not a good place for a painting since it would have to be cleaned all the time. What do you think winter, spring, summer, or fall for this next village scene? Is everyone tired of winter yet? We're still getting snow. I can't imagine you wouldn't be out there with your brush in the snow. It's got to be somewhat beautiful, if it just didn't cripple us so much. Love your cupcake. How about early, early spring with trees budding and daffodils popping up and maybe a shop selling kites for those windy days of March? Can you tell I'm having spring fever in the middle of winter? I just love your fall paintings. They are so vibrant and stunning. I always love your cupcakes Catherine....ow yes, boy am I tired of winter, my least favorite season. I would love to see a new spring village. I am so ready to be done with winter. Hi Sweets! I linked you on my new blog. Hugs.